Mary Jane Blakely, 87, of Sun City Center, passed away April 6, 2019. She was a wife, mother, grandmother and great-grandmother. She was dedicated to reading and was an assistant librarian of the Sun City Center Library for 20 years. She loved serving and interacting with the patrons that shared her passion for libraries, books and reading. She was a member of Trinity Baptist Church. Her husband, Bob, passed away three years ago. Survivors include her two sons, Robert Blakely, Jr. and wife Francess, Clifford Blakely, and daughter Robin Phillips, five grandchildren and eight great-grandchildren, as well as her loving canine companion, Bridget. She will be laid to rest at the Sarasota National Cemetery, next to her husband at a private service. A memorial service will be held at 3 p.m., Thursday, April 11, 2019, at Trinity Baptist Church, 702 Del Webb Blvd. W, Sun City Center, FL. Floral arrangements can be sent to Trinity Baptist Church. 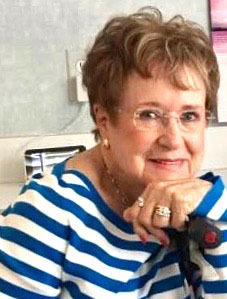 SUN CITY CENTER, Florida – Jeannette Benoit Dion, 89, originally from Lewiston, Maine, passed away peacefully, on 5 April 2019, surrounded by her loving family. She endured a lingering and burdensome illness without complaint, a testament to her faith. Jeannette was born in Lewiston on 28 January 1930, the fourth-born child of John Victor Benoit and Adrienne Zoraide Roy. She attended Sainte Croix Parish elementary school and graduated from Lewiston High School. After a period of working retail for apparel merchants in Lewiston, she married the love of her life, Robert Ovila, whose family originally hailed from the Province of Quebec. Jeannette and Robert had six children: Joanne, Michele, Robert, Claudette, Ann Marie and Deborah. Jeannette’s unconditional love of her husband and children, included a large, close-knit extended family. She eagerly awaited Franco-American holidays throughout the year. Her cooking and baking filled her home with alluring aromas, especially beginning the day after Thanksgiving. She loved to entertain, to laugh heartily and never had enough family around the table. Reveillons on Christmas Eve were preceded by French and English carols while she played the piano with fervor, surrounded by a chorus of several generations. She always had a canine companion and loved them all, but her Bouvier des Flandres was her most cherished. Jeannette was preceded in death by her parents. She leaves behind her husband, Robert Ovila Dion, of 70 years; her daughter, Joanne Dion of Sun City Center, Florida, and her husband, Tom Wisely; daughter, Michele Benoit Dion; son, Robert Ovila Dion of Topsham, Maine, and his wife, Charlene; her daughter, Claudette Dion Agren of Bradenton, Florida and her husband, Douglas Agren; her daughter, Ann Marie Payne of Lewiston, Maine and her husband, Dwight Payne; her daughter, Deborah Dion Simon of Milwaukee, Wisconsin and her husband, Bryan Simon. She is also survived by her brother, John Benoit of Bangor, Maine and his wife, Priscilla and her sister-in-law, Therese Dion, of Lewiston, Maine. Additionally, Jeannette leaves behind Dee Turmenne Dion, the mother of two of her grandchildren and a dear, devoted daughter-in-law. She will be missed by her grandchildren: Julie LeBlanc; Douglas Leblanc; Robert Dion; Courtney Dion; Tyson Paradis; Erin Harmon; Jeremy Payne; Katelyn Payne; Brianna Roy; Emily Payne; Hannah Kirschner and Sophie Kirschner. Also, great-grandchildren: Douglas, Braden, Fiona, Robert, Addison, Max and Jackson. Our entire family would like to extend heartfelt gratitude to her loving care-givers, notably, Edna Carlin, Hope Romero and Ingrid Scobie; Mobile Physicians’ nursing and physician staff and the compassionate LifePath Hospice nurses and physicians. There will be no service at this time.